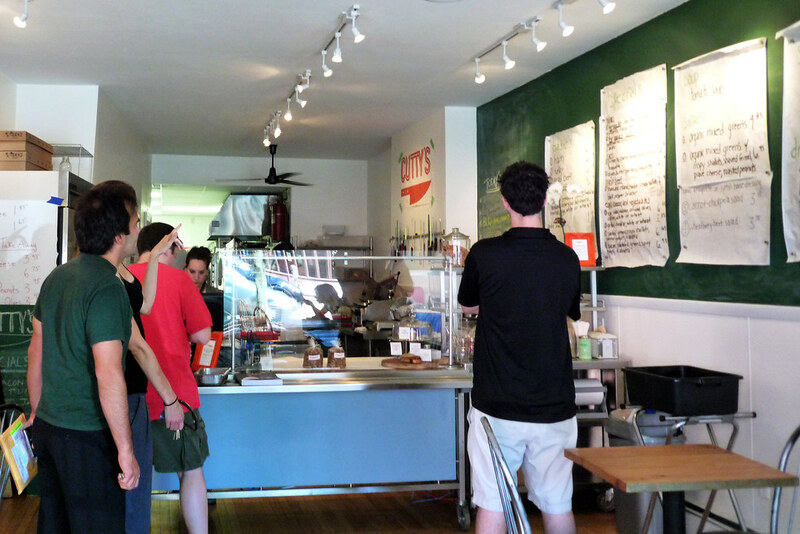 In this solo dining adventure, Gary enjoys the sandwich stylings of Cutty’s in Brookline, MA. The day after having lunch at Olecito, we had lunch at Cutty’s, a relatively new – at the time, anyway – sandwich shop, also in Brookline. Actually, we almost didn’t have lunch here because it was Saturday afternoon, we’d been watching the World Cup and just hanging out at casa de JP when we checked their website where it said that the place closed at 3 pm – we saw this at, oh, around 2:30 pm. With this knowledge in hand, we essentially raced out and walked as fast as our legs could get us there before the place closed which we did with just over five minutes to spare. It’s a good thing we made it because it would have been a major bummer if we hadn’t. I’d already been aware that they made a good sandwich thanks to the post of one blogger – okay, Kenji of Serious Eats – so I had this place high atop my list of places to eat when I next visited Beantown. And here’s the kicker – Saturdays feature roast pork! Roast pork! That’s got me written all over it! 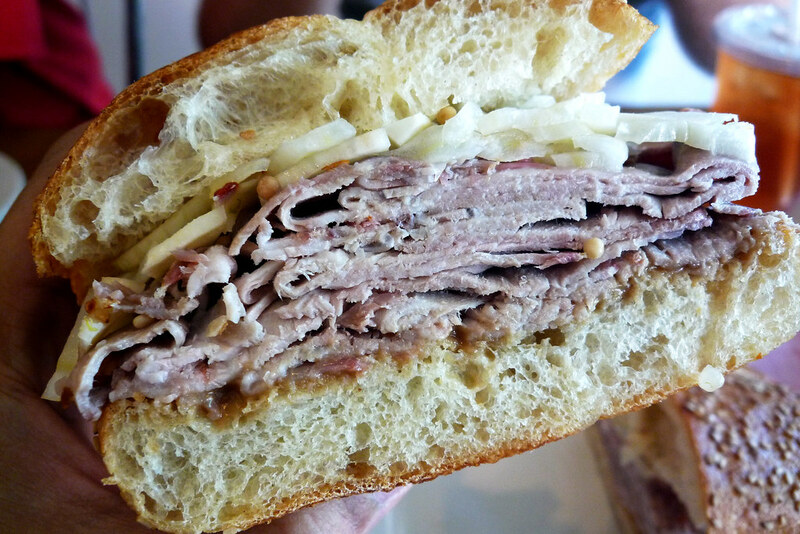 So that’s why, despite all the delicious offerings on their daily menu, I had to go with the Pork Fennel Sandwich. 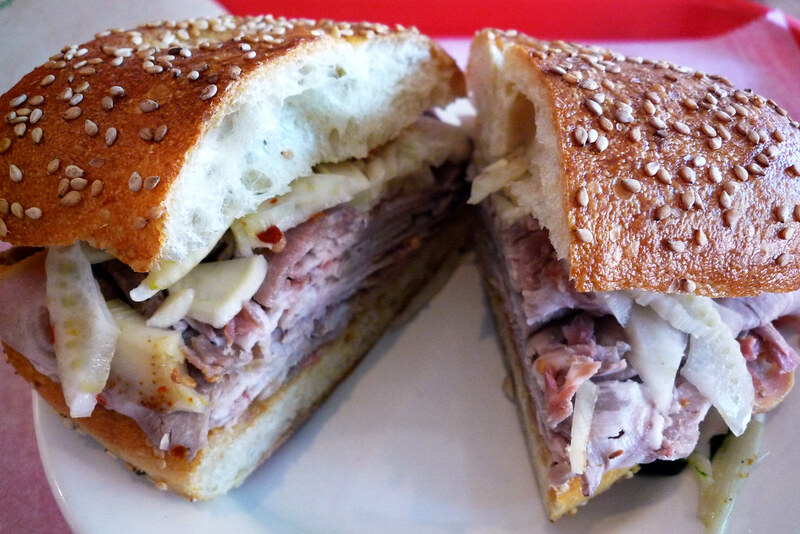 It’s got roasted pork (of course), pickled fennel, and roasted garlic, all on a sesame seed roll. This, folks, is an extraordinarily excellent sandwich. The pork is beautifully cooked, tender but not mush and just slightly chewy, though perhaps just a little on the under-seasoned side. Though that’s fine since the roasted garlic takes care of any seasoning issues – potent but not overwhelmingly garlic in flavor. The pickled fennel added a crunchy, acidic component which was welcome as it cut the stronger garlic flavor a bit. As good as the sandwich was, it wasn’t terribly filling so it was a good thing I got their Brown Sugar Cookie. 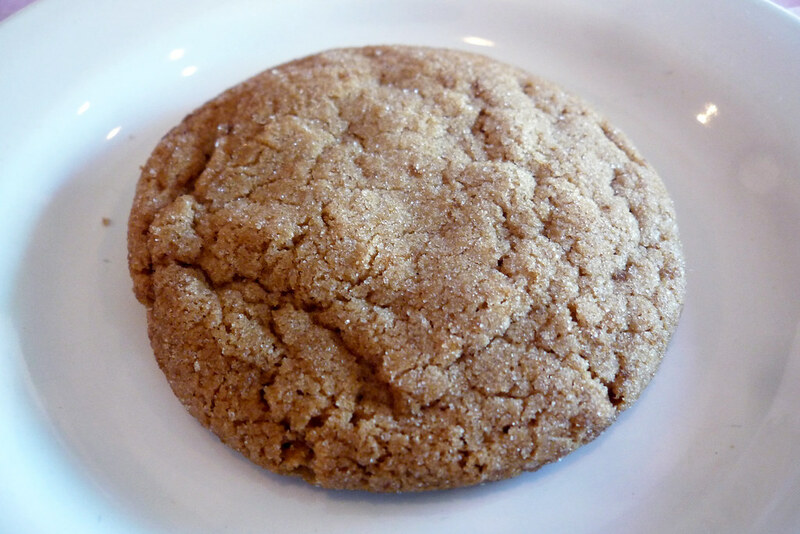 A simple cookie loaded with brown sugar – tasty, not spectacular, but it doesn’t have to be in this case. Though I’ve only been to Cutty’s once, it’s not hard to see why people like it so much. Quality ingredients and some excellent crafting make for some pretty awesome sandwiches. The sandwiches here aren’t cheap though at $8.75 for my sandwich, it’s not as bad a value as their regular sandwiches, which seem much smaller and at only $1 less than the special. That said, I’d come back and try them just to see if they work as well with cold cuts as they did with the roast pork. Or I could just always come on a Saturday for the roast pork – that’d be more than fine with me. Cutty’s. 284 Washington Street, Brookline, MA 02445. [Show/Hide Map] (617) 505-1844.